Went to Glen Lake today with my other best friend – my daughter Jennifer. Wanted to get out for a bit and not have a long drive. Glenn Lake is just that places for me us. Air temps in the high 40s and water between 49-54 degrees. Wind was N NW at 5-7 MPH. We were out on the water a little after 10 and tried silver buddy fishing the points on the sunny side of the lake. Total count for the day was 1 largemouth bass, 1 white perch, 1 yellow perch, and a lot of crappie. Jenn got a very impressive crappie halfway through the day. She caught about half of that mix and had another fish on later in the day that was making that rod bend in half. She lost it before either of us could see it. We left the water around 2. Or tried to anyways. You would think that we were one of the only people on the lake but there were a few boats out today. And as we neared the ramp there were four guys all loaded up and launching. They spent the better part of 15 minutes trying to start their boat still on the trailer backed into the water. After seeing me waiting they finally pulled it out to let me load up. Even after we put everything away on the boat and drove off they were still trying to start it. It was a fun day fishing with Jenn. I’m happy that she caught some fish today and also had fun. There is nothing like fishing with my kids. I love it! 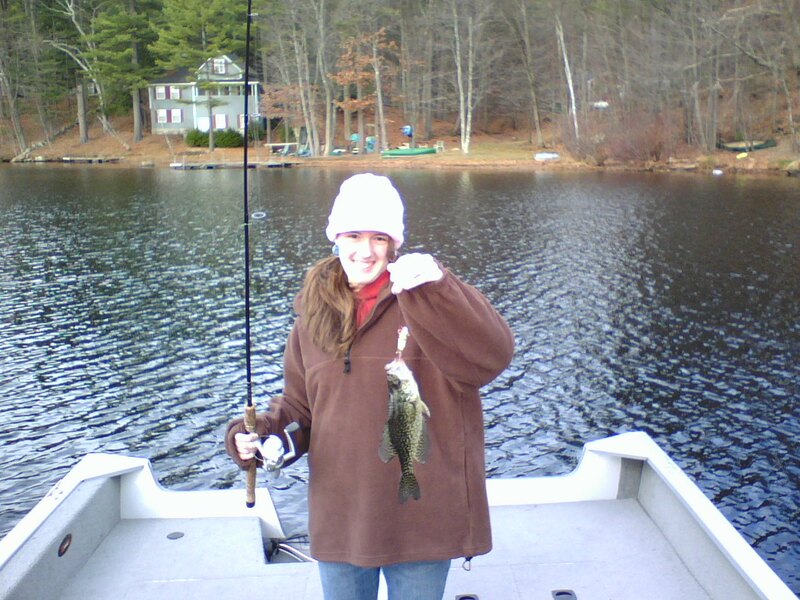 This entry was posted on	November 20, 2006 at 3:56 am	and is filed under Freshwater Fishing Trips.